I have loads of handy Internet marketing tools in my toolbox and this includes a collection of WordPress premium themes. Over the years I have tried many free WordPress themes and also paid WordPress themes, even more than I care to mention. Therefore after all this time I have a set of regular WordPress premium themes that I use for my websites. At this stage I am probably building two extra websites a year and they all require something different. For example, recently I built a WordPress website hosting website and used a premium review theme from the Elegant themes collection. Another recent website that I am building at the moment, but have not promoted at all, it is called Web SEO Tips. I am still laying the foundations for this one in my spare time. This website is built with Thesis and a ThesisAwesome skin. You can see why I need a variety of WordPress premium themes in my Internet marketing tool box. In this article I am not going to talk about free WordPress themes because if you are creating an Internet marketing business and planning to do blogging full time, you need to invest in some tools to make you look professional. I am simply going to tell you why I have chosen these particular WordPress premium themes. As you can see, without Elegant Themes it would be absolutely impossible for me to put up a professional website in under an hour. In the video I have installed the in review theme and show how to customize it. I always say that WordPress is easy, and it may not be that way for everyone, however it is easy for what you are actually developing. Building WordPress website and then using one of the elegant themes will make you look like a pro. These kind of websites use to take months to develop. Not just that, you needed to many geeky skills to start a WordPress website from scratch. Thesis it is probably for the more experienced Webmaster because you will be dealing with customized code to change your website. You will also be using a lot of CSS and designing something from scratch. Thesis is a framework to build on. This website you are looking at now is using thesis and it started from there shell and is progressing slowly as I get time. I possibly could have been happy with simply buying elegant themes, however I cannot help myself, and I needed to know what was so great about thesis. In Thesis everything revolves around the customfuntions.php file and the Custom Css file. All you do is basically edit these two files to make the website do what you want. One wrong move and you have to go to your server and replace the file to get your blog up and running. When you get used to it though, it is a breeze.. Again there is amazing support for this WordPress premium theme and you can go to the thesis forum and they will look after you until your question is answered. If you go to the forum and explain what you want to do with your code or with your CSS, they will give you the exact code already done for you. Therefore you really don’t need to know how to create the code, but you do need to know how to place it in correctly. Along the way you learn. We have tutorials on this website about how to add a navigation menu and how to customize Thesis. Some people prefer the Genesis framework. The beautiful themes in the Studio Press gallery make me want to buy them but I know I have enough with what I have. I find this almost the ugliest WordPress premium theme I have in my Internet marketing tool box. Sorry to the developers but it can look great with a bit of customization. That’s not the point though. Socrates WordPress theme is the highest converting WordPress theme I have ever used. It produced the best AdSense click through rates and also the best affiliate sales. When I moved my blog to thesis I spent a lot of time trying to reproduce Socrates conversion rates. So maybe there is something to say about ugly websites? The support with Socrates is absolutely amazing and I believe this is a great WordPress premium theme for a new Webmaster. It is not that difficult to use at all as everything is laid out for you, and if you don’t understand, you can get help. The other thing about Socrates that people do not even take into consideration is their banner exchange program. You can place a banner on your website and clock up impressions. Then you can go in place your Banner code into the Socrates system and other websites will display your Banner. I have actually made a lot of sales out of placing my banner inside the Socrates banner exchange program. I also sold the Socrates WordPress website theme as you will become an affiliate after buying it. Therefore I never paid to the Socrates WordPress theme, and it only gave me a profit. This is the quickest purchase I have made! I saw this theme on another bloggers site and rummaged around to find out what theme it was. Of course they did not have a link so I had to look at the source code to find the name of this fantastic theme! I bought this Max Mag theme and had it up an running within the hour. Crazy decision I know, but it worked out to be very easy. I love the fact that I can easily have different content on sidebars for the homepage and posts, the fact that you can make up amazing displays on the homepage, and so much more. 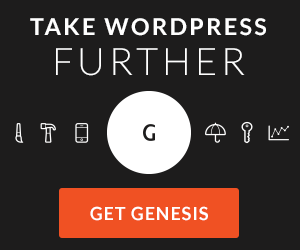 Genesis is another framework theme like Thesis. They are both considered the best, but recently I have been impressed considerably by Genesis. This theme framework is simple to install, has an awesome design out of the box, and is made for the future. I have also noticed that the theme is fast after doing many tests on pages through the Google page speed tester. I have been testing a few different themes in comparison and Genesis is coming up trumps. I am ashamed to say that I have bought the AdSense CTR (click through rate) theme. This was my biggest waste of money and I probably had it on my blog for about two hours. Unfortunately I forgot to go and get a refund, but it is a decent theme, it was just my conscience that wouldn’t let me use it. I could not make a website that was made for AdSense (MFA), and this theme definitely looked like that. I have also bought WPRemix, The Ultimate blogging theme, and more. The thing is that most are forgotten as they did not impress me in one way or another. It is great to get help if needed which makes life stress free and saves time. They just work as the developers have an obligation to make them user friendly and error free. You can join a community where other webmasters are doing exactly what you are doing. For example I am using the Inreview Theme from Elegant Themes and there is a forum just for that theme. In fact there is a special section for each theme. Your theme will look more professional. All of the themes have basic SEO options included. Including a fab navigation system. I guess you could be asking if these WordPress themes are any good for Internet marketers? Well if that means selling from your website, then yes they are great! This is what I do for a living, full time, and WordPress themes that do not convert do not get a second look from me. I really do not think I need any more themes and can make do with what I have. I prefer both Elegant Themes and Thesis packages as they both give you an endless scope. Socrates is great but the ugliness gets me. (sorry Socrates developers) It is more of a mans website theme. Which WordPress Premium Themes do you have in your Internet marketing toolbox? It shows which theme was used on a WordPress blog. Nice collection of the premium wordpress themes. But for the new bloggers, I would still advise them to make use of the free and the child themes available as they have little to do at the start of their blogs. When they know more about blogging and the importance of the presentation of the articles, they can easily swap for the premium themes. Rest, theis is really an awesome theme! The elegant themes option is an enticing choice. The list provides a myriad option which can provide a stress free process. Thanks for sharing this valuable post. I really want to invest in Thesis theme as I have heard all good things about it. My theme is Adsense optimized. But that is good. I wonder why do you feel that it is not right to have that kind of theme. Hi Mitz! I’m all for giving my readers a visually appealing treat, I personally love the elegant themes package–this is highly recommended and the best value for money! Thanks for your other suggestions! You won’t believe this! This is the second time in a day that i am reading about elegant themes. Does look very attractive and user friendly. Will surely check out that and the others you have mentioned. Thanks for the very insightful post! Het MITZ, Thanks for sharing these useful tips on the critical decision of promoting affiliate links. Aayna recently posted..Avoid Gold for cash scams now! Hi Mitz! I’m contemplating on purchasing a couple of themes for the other sites I’m planning to develop and this post sealed the deal. Thanks! Thanks for these great tips, Mitz. Where and when to promote their affiliate links and banners is an important decision to make. Knowing when, where, and how to advertise your business is the holy trinity of marketing. With the internet taking over the way that companies showcase the products and services the landscape is definitely changing. Thanks Mitz. Have been leaning towards Studiopress but will take another look at Elegant. Being somewhat technically challenged doesn’t help when using free themes but then again not all paid themes have support as good as claimed so it probably pays to shop around and not rush in. So pleased I came back to read this post again and this time watch the videos. As I said previously I had added the free flexibility3 theme to 5 of my niche sites because I had seen quite a few sites using that theme but sadly none of mine look as good. Now after watching your helpful videos I’m thinking the Elegant themes might be a better bet although I don’t know if the paid flexibility3 option is as helpful in terms of design tips and support. Anyway you’ve given me food for thought. BTW my niche sites are in health, weight loss, relationships/dating and golf. Do you think Elegant themes will give me enough scope in those niches? Elegant themes gives you everything you need. Just go and search through their gallery and see the variety. I have done other reviews about their themes like the eCommerce theme and the WordPress directory theme. Thesis is truly awesome! I used it for one project and it turned out really nifty! There are so many beautiful premium WordPress themes available, I like the desk ones! I have my tools ready and I may have paid for them in the beginning but now they are priceless! I really actually make use of all these themes and I have also got used to using them which saves time wondering how to change anything. I work with the free themes of wordpress, and as I look to my results, they are pritty bad…. So Today I’m going to spend some dollars on socratis. Finding the right WP theme is an hard way,because you need to fit both economical and esthetic value. Changing theme,colors,background and do some test, It’s a vital part of an active blog. I ‘m using Blueprint at the moment, which is a free theme I got from the WordPress Theme Directory. I recently bought Canvas from Woo Themes, but I’m still playing around with it on a sandbox WordPress installation. I started off with a free theme because I just wanted to get cracking with my site without spending a lot of time looking for a theme. I always planned on getting myself a decent theme, but when you’re getting started with WordPress you’ve got so many other things to think about. It can take a lot of time searching for themes if you’re new to WordPress and you don’t know where to look. Anyway, I’m really enjoying playing around with Canvas. Out of the box it looks very basic, but it’s highly customisable. According to Woo Themes it’s their most ambitious theme yet. It does seem as though WordPress is one of those programs that once you learn how everything ties together and works, it is a piece of cake. I do think the websites (that I have seen) are very professional and appear to have a lot of thought and talented input. And, all of these products come with a support staff. So, they sound like super deals. It is simply implementing and writing!! Oh, and funding. I really want to check into Thesis also. Thanks for sharing such great information. I appreciate you sharing your experience and expertise, it prevents so many missteps! Yes I wish I had been told all this…I wasted a lot of time and money in the early days..The reason these themes are so great is because you can use them for more than one website…and when you get into building websites these are very handy to have around. Check out our tweet and win premium themes. This time we collaborate with Theme Junkie. You guys might get lucky. I have ElegantThemes, Woo, StudioPress, iThemes (Builder), WordPress Product Review Theme, Premise for WordPress, and Catalyst. I LOVE premium WP themes and am constantly trying out new themes. Every penny I’ve spent on themes paid off at least tenfold (I build my own websites for my online and offline businesses). I probably have more premium themes in my toolbox than most people and have spent many hundreds of dollars on themes; however, when you consider the cost of hiring a website designer, my investment is much less and I have access to all kinds of amazing website options. WOW you are a serial shopper!! I agree that every cent I have paid for premium themes has paid off! One point I struggle with is all of these themes cost money. Just wondering if there are any good free premium wordpress themes that someone could use who is just starting out on a low budget. Personally I am pretty saavy at using wordpress and I am not intimidated by having to install complex themes or pay for a theme that can make me money but I know there are probably a lot of people out there struggling to make a buck who don’t have money nor the technical skills to make these work. Do you know of any themes you like that are free but still look good? For Mike. There are a few good free themes out there. One I’ve found easy to use is Flexibility3 and Holly Powell (SimpleHowToVideos.com) provides good video tutorials. Thanks for that tip. I looked at the site. It looks like you can download the framework but you have to buy their skins for about $9 to use with it? I am going to try installing it to see what it looks like out of the box. I am a member of Elegant Themes and have thesis also, but I use Elegant theme for quick and easy way to get a good front end looks….I have also just used Inreview for one of my new sites, it’s a good theme to create some review blogs. Just google for it and check it out. I use it on 60% of my blogs now. I have a lot of trouble editing the header. Does Google penalize you for using the same theme for different websites? I have some different ones but not many. Personally, I like Socrates. While I am here, I disagree with Robert that content is not king. You can use your theme for as many sites as you like..Just make sure everything else is different. So tags, description, site name and so on…all unique. I have heard a lot about thesis recently used to have it on one of my blogs when I first started as an Internet marketer but I didn’t like it. After reading your post I think I might have to give it another look. I have seen Some of the thesisAwesome skins And they look very nice. One thing I must admit is that with the premium themes there’s no messing around everything you need is in the user panel like SEO options, Google analytics etc so there’s no need to install certain plug-ins. After using thesis i forget about other themes. just thesis with ThesisAwesome skin is a perfect match for my blog. would consider to change theme if get better option and look than now i am having. Genesis is a close match to Thesis but they have all the groovy child themes available too. That does tempt me sometimes. I recommend you give Genesis a try. It’s a good deal and well worth it. The link through my name above leads to an extensive Genesis review that I’ve updated regularly. Peter Lawlor recently posted..DIY Website Builder: Good Idea? ..but of course this gives you an extra instance of “WordPress themes”…. OMG are you serious? Unfortunately I am not perfect and I do not strive to be. I am simply sharing my information. Haha I think he is serious. That kind of gives away where your focus is at Mick. I had no problem whatsoever reading this blog. Show me a grammatically perfect blog that is not in the grammarophiles niche. Blogs are for humans and made by humans. Get over it. OT: This post can save a lot of people a lot of money and headaches. There are so many themes out there, and many of theme are not worth the time and money. How Important Is SEO In Website Marketing?